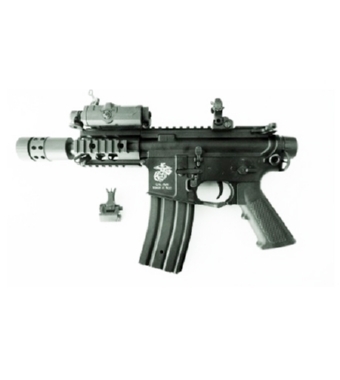 PRODOTTO DALLA JS TACTICAL, FUCILE ELETTRICO III GENERAZIONE MODELLO M4 STUBBY KILLER FULL METAL. BATTERIA IN DOTAZIONE MINI 8.4V 1100mAh, CARICA BATTERIA 220V 300mA. GUSCIO IN METALLO CON LOGO, PORTA BATTERIA LARGE TYPE ESTERNO, TACCA DI MIRA ABBATIBILE, 4 SLITTE PER IL FISSAGGIODI ACCESSORI, SILENZIATORE IN DOTAZIONE.